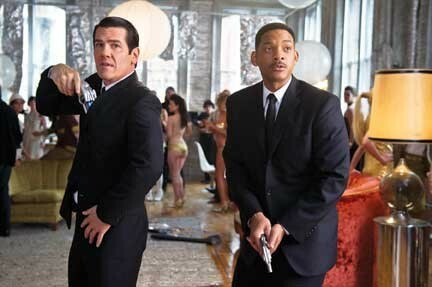 A decade later, the well-worn Men in Black franchise makes a surprisingly lively return. Coming a full decade after the cash-grab second installment of the sci-fi comedy franchise, the unlikely and seemingly unnecessary Men in Black III is also surprisingly enjoyable. At a time when most blockbusters take the form of live-action cartoons, here's one that actually has a little Looney Tunes in it. As guided by well-chosen director Barry Sonnenfeld, who brought the incorrigible wit of his precursor Addams Family films to the enterprise, the original Men in Black rose above its station. Based on a comic book series from Lowell Cunningham, the film explored the workings of a mythical INS for extraterrestrials via a pair of agents — Tommy Lee Jones' stern, deadpan vet Agent K and Will Smith's charismatically nonchalant new recruit Agent J — that updated the Eddie Murphy/Nick Nolte salt-and-pepper buddy-cop chemistry from the 48 Hours movies while mostly freeing the concept of its racially charged undertones. The first film was a gentle satire about negotiating the diversity of modern urban life and was so packed with charm and visual detail that plotting was happily secondary. The second film was a purposeless, product-placement-laced rehash. And yet, though I can barely remember the plot, I still recall the multi-limbed alien working as a behind-the-scenes letter sorter and the entire community of miniature visitors living inside a Grand Central Terminal locker. A deft negotiation of ethnic humor in the kitchen of a "Chinese" restaurant aside, Men in Black III is less rooted in urban satire, instead finding its sense of purpose via a time-travel plot line that enables a deliriously enjoyable performance from newcomer Josh Brolin, who gets to mimic Jones as the 1969 version of Agent K.
The film — clocking in at a breezy 103 minutes — sets its plot in motion with a brisk series of opening scenes. "Boris the Animal" (Jemaine Clement), a Randy Savage-lookalike humanoid alien, escapes solitary confinement on a lunar prison facility and heads to Earth to plot the destruction of the planet and seek vengeance against Agent K, though not necessarily in that order. Agent K had apprehended Boris — shooting off his arm in the process — back during the Woodstock era, and Boris' new plan involves time travel, sending "The Animal" back to 1969 and Smith's Agent J back after him. The film offers a snazzy literalization of the "time jump" concept, with the Black Friday stock market crash and a WWII ticker tape parade flying by in transit. Back in 1969, the film doesn't overplay the fish-out-of-water period details the way others might and assumes audience knowledge — or maybe just doesn't care — with a trip to the Factory, where Andy Warhol is revealed to be an MiB agent surveilling alien visitors and "I'm Waiting for My Man" is on the soundtrack. Jones and Smith don't bring the same energy to this material as they did 15 years ago, but everything around them — Brolin's brilliance, a welcome turn from Michael Stuhlberg (A Serious Man) as an alien unstuck in time, the constant rat-a-tat-tat of visual gags and sidelong observations, the zippy cartoon pacing — more than makes up for it. And all that turns a seemingly worn-out concept into a satisfying summer movie. Men in Black 3 is not showing in any theaters in the area.